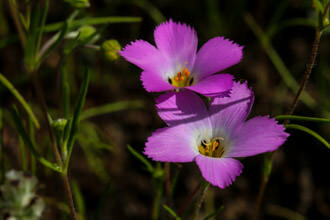 Globe Gilia or aka Gilia capitata ssp abrotanifolia is an annual tap-rooted herb that is native to California. The plant blooms from March to June. I remember the first time I saw this flower, I had walked by a patch of these flowers and not noticed them at all. To be fair there were lots of Lupine, Owls Clover and Goldfield competing for my attention. 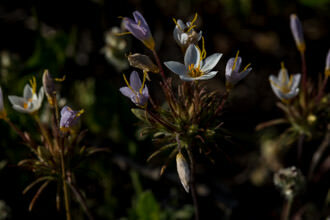 On the way back down the Western Plateau Trail I finally noticed this small white ball like flower. Upon closer inspection I noticed the five blue stamens extending beyond the five lobed corolla in complimentary colors. Having not seen that before I was immediately interested in identifying this plant. 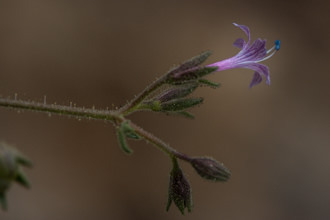 I took several photos of the plant and noted that the leaves were very narrow and similar to other Phlox plants plus the leaves were lace-like e.g. poppies or White Pin Cushion. The flowerhead was a cluster made up of individual flowers (anywhere from 10 to 100!) with each flower being about the size of a U.S. Quarter. The colors on one cluster were white, pale blue-lavendar with many blended variations. With all this information and a guide that I still had not figured out I was at a loss to identify this plant. I reached out to a contact at COSCA and was at first provided the wrong identification. In the meantime I went through every white flower in the guide (Milt McAuley's Wildflowers of the Santa Monica Mountains) until I found it. The next day I received another email back from my contact and she made the same identification. She had gone back to the area where I had seen the flower and realized that she had never seen the flower growing in this area before. 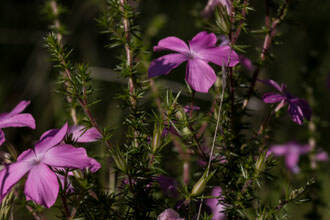 Next thing you know I am seeing this flower on most of the hikes or trails I was working on. Showing others this flower proved to be a delight as other people were struck by the beautiful white and blue flowers that were so easily overlooked. 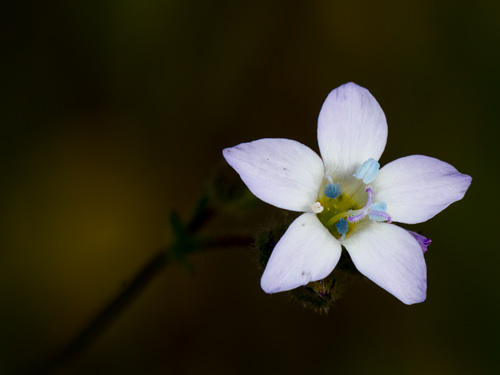 Globe Gilia can be as small as 10cm or as tall as 90cm which translates as 4 to 36 inches. Often the stalks are bright green but become reddish as the stem gets larger. 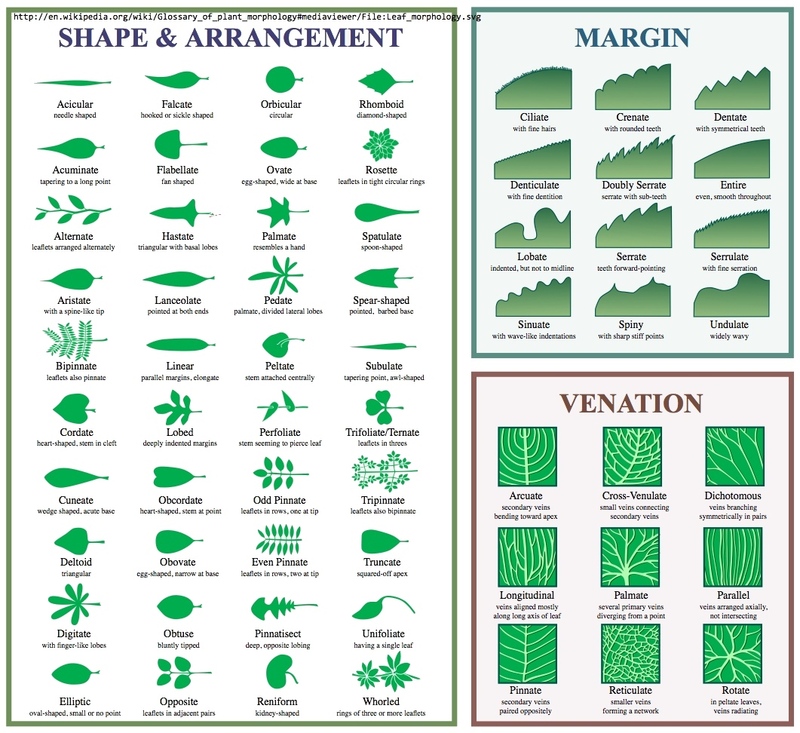 These plants have more and denser foliage at the at the plants base - Botanists classify this as "Leaves - Basal". Leaves become alternate as they move up the stem. Look for this plant in chaparral and sage communities like Pt. Mugu State Park and the Western Plateau Trail. The plants can be solitary or dominate a slope. 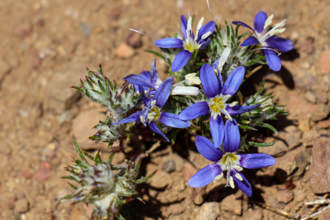 There are several other kinds of Gilia in our mountains - Angels Gilia, Stinky, Splendid and Purplespot. They all share the same style of flower but are not clustered like Globe Gilia. Name Origin: Named for an Italian naturalist and clergyman Felipe Luigi Gilii (1756-1821) who was also the director of the Vatican Observatory. Some books reference a Spaniard named Felipe Gil but they are likely wrong. Follow this link if you must know more! The species name capitata means head-like and of course refers to the plant's rounded cluster of flowers. Last modified: December 05 2017 11:39:33.